Sometimes you don't need a big round umbrella that covers a large area. Sometimes all you really need is something half the size. That's where this awesome looking Half Patio Umbrella comes in handy! At half the size of a normal patio umbrella it still covers quite the amount of space. Sometimes we like to sit out back of our house on the porch, but it's not covered so if it's super sunny or raining we don't use it as much. But now that we have this umbrella we can open it up and both sit under it to stay dry and not overheat. 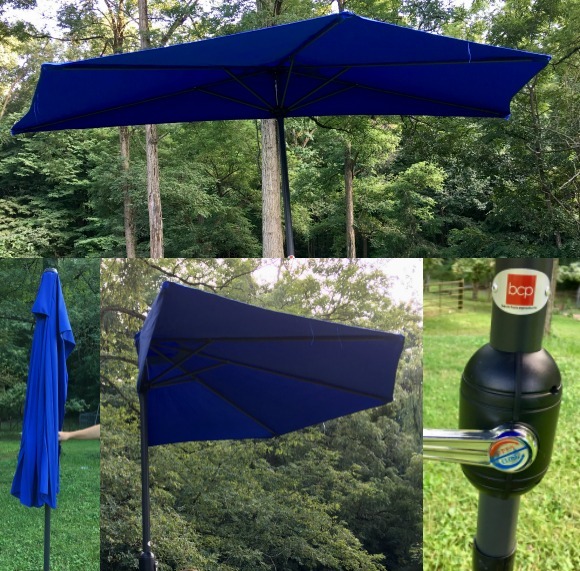 The umbrella is pretty basic to get ready for use with just two poles that slide together. From there you just crank the handle and up goes the umbrella. The polyester material is nice and thick so the sun doesn't peek through and the rain doesn't leak through either. The only thing I will point out is that you'll need a base to sit it in, or a table with a hole in the center to hold the pole steady. Half Patio Umbrella is such a great idea! It seems convenient and easy to use also.